Dr. Crusher investigates the death of a Ferengi scientist after the mysterious failure of a promising experiment in metaphasic shielding. Yet another reference to Dr. Selar! It's officially a running gag at this point. Crusher's civilian clothes are frumpy and sad. I'm not a fan of the flashback storytelling when it's not done in a clever or interesting way. It almost feels like the episode was structured this way just so there could be a hook at the beginning. What gives Dr. Crusher the expertise in shield engineering to assume she knows better than the Ferengi government and the greater scientific community? If it were La Forge or Data arranging this motley crew of alien scientists, it would be believable, but Crusher? What Crusher and Dr. Rega are suggesting by having someone fly a shuttle into a dangerous star before more careful experiments can be done strikes me as wholly unscientific and irresponsible. I don't know exactly what it is, but something about this episode is jarring. The scenes are overly staged--almost theatrical--and the acting is unusually stilted, even from some of the better actors on the show. The dialogue feels off, too, which is only made worse by the melodramatic voiceover. I really can't explain it, but the episode almost feels like the first season; it's amateur hour, which is incredibly odd given the high production values of Season 6 thus far. They're just phoning it in. Dr. Crusher should lose her medical license (or whatever the 24th Century equivalent is), and she should be court-martialed. There is no excuse for knowingly performing an autopsy against the wishes of the family, the religious values of the patient's culture, and the expressed command of her superior officer. Period. Nothing that happens after the fact changes Dr. Crusher's clear ethical breach. It's sheer insanity that she is allowed to continue on as if none of this ever happened. "Sir, we have lost contact." Gee, thanks, Worf, I kind of noticed when the viewscreen snapped off. So the dude survived an autopsy because he has a "slow rate of cellular decay"? Um, that's... that's... THE MOST RETARDED PLOT TWIST IN THE HISTORY OF STAR TREK! It's already been established, within this very episode, that an autopsy requires cutting into a body. If an autopsy didn't require anything invasive, the Ferengi wouldn't have cared about Crusher giving Dr. Rega an autopsy. So, Jo'Bril would have to be able to fool all the medical equipment in Dr. Crusher's state-of-the-art sick bay, survive being cut open and explored from the inside out, be fine with laying in a morgue freezer for hours on end, and be fully conscious at all times. I cannot make a facepalm dramatic enough to express how that "twist" makes me feel. The phaser hole through the torso is pretty cool, though. So, does that mean Dr. Rega really did commit suicide? This could have been an interesting story that dealt with how various alien species approach the scientific process. Are scientific values and the scientific method universal, or are there differences between how a Klingon would conduct research versus how a Vulcan would? Instead of delving into anything interesting like this, though, we get an episode of Murder, She Wrote with tangental sci-fi twists that are merely plot conveniences. 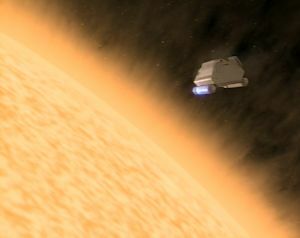 You have Crusher narrating nearly the entire thing in flashback as she is driven (for no discernable reason) to pursue the research and then conduct her own investigation into matters, complete with predictable interrogations, one-dimensional characters, cliché lines ("Are you accusing me of something? "), and yawn-worthy intrigue. This is a pathetic waste of perfectly good material.